This blog-post was written and researched by Katie Gill a volunteer at Archives+. 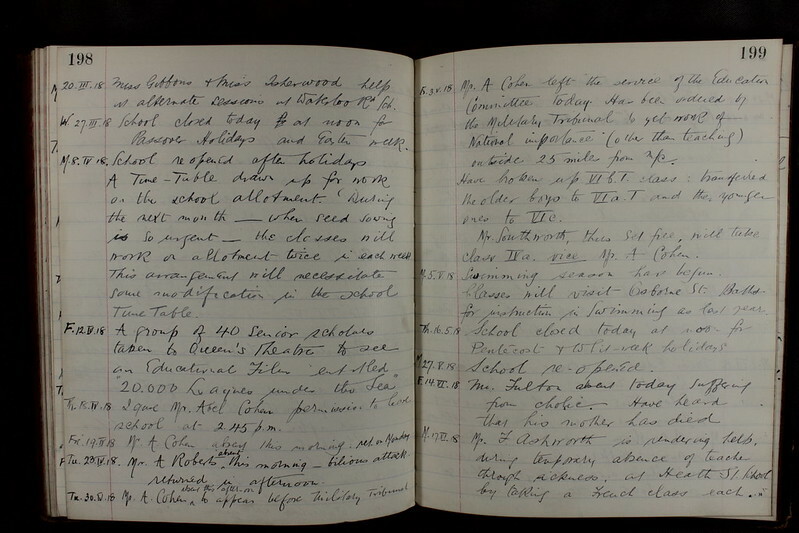 As a volunteer, for the WWI centenary I was tasked with looking through school log books from the Manchester area to look for anything that might tell us how the home front was affected. I wrote a blog about the digitising process which can be found here. 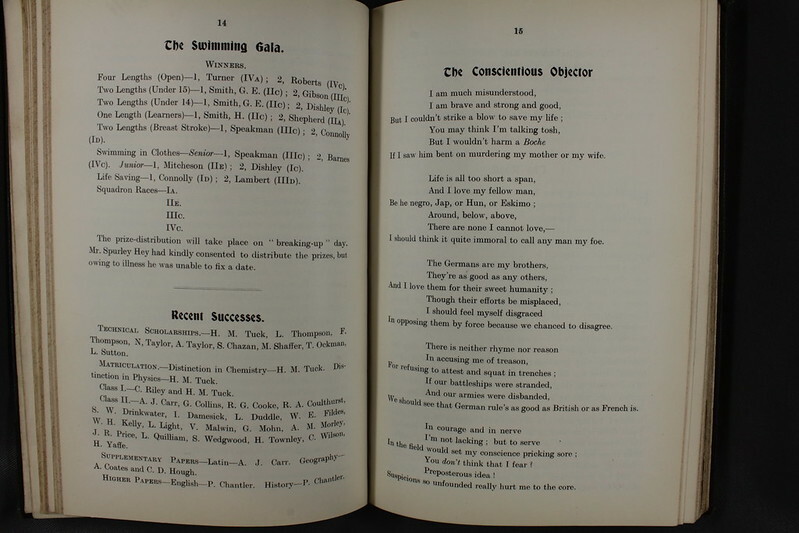 While searching through the log books I had discovered a poem entitled ‘The Conscientious Objector’ and it is a poem which appears to sympathise with those who objected to fighting in the Great War. It suggests that it is not cowardly to not want to fight but rather they object to killing their fellow men. During the First World War around 16,000 men had been arrested and imprisoned in labour camps due to their refusal to enlist in the army. Most objected on religious grounds, or political, they saw the war as an imperialist war, there were those who were humanists and so refused to kill fellow men and finally those who objected to government intervention in their lives. These men received little sympathy and were often scorned as is shown in the cartoon below. The cartoon clearly shows everyone else in the family contributing towards the war effort whilst the objector sits at home and does nothing. Another case of the treatment of a conscientious objector has also been noted on a website called documenting dissent in an article by Gail Capstick. Emanuel Ribiero, a gold and silver engraver from Salford, was arrested in 1917 for not enlisting in the army or contributing towards the war effort. Ribiero was fined and sent to barracks in Bury. Going on hunger strike he was forced fed for nearly a year at Lord Derby War Hospital. In March 1918 Ribiero was court marshalled and sentenced to two years of hard labour but was released in May due to health grounds. These experiences clearly demonstrate the poor treatment of CO’s and on the 100 year anniversary of the outbreak of World War One there was an honouring of conscientious objectors and their suffering for their beliefs.